The Company Administration process is usually seen as quite complex, and it often is, although sometimes it can be fairly quick and straightforward. It all depends on the specific circumstances of the company involved. However, the main steps in the process are the same – it’s how the administrator deals with these steps that really counts. 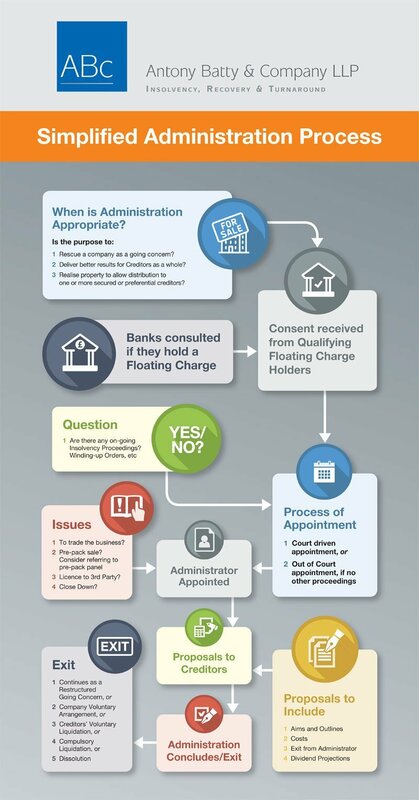 For those who are less familiar with the administration process, we’ve put together this infographic which simplifies the process. Click here to some testimonials from the company administrations that our teams in London, Brentwood, Salisbury and the Cotswolds have worked on. How Does the Company Administration Process Start? Administration is used when it is considered that at least part of an insolvent business can be sold or salvaged, with the administrator acting in the best interests of the creditors, as is their statutory duty. Once the decision has been made to opt for administration, the directors of the company can choose to appoint an administrator. Often several administrators are considered before the appointment is made. However, holders of floating charges (often a bank or banks) can force the appointment of an administrator if the company has not upheld the conditions of any debenture agreement. Is it possible to trade the business? Is a pre-pack administration a possible option? If yes, consideration needs to be given to referring the matter to the pre-pack panel. Could it be licenced to a 3rd party? Is closing the business down the only viable option? For example, predictions were made that Carillion would gone into administration before it became clear that its problems were far worse than anticipated. What Happens When the Administrator is Appointed? The proposal must be passed by the creditors before the administration can proceed. However, as part of their statutory duties, the administrator is required to examine all other options and recommend an alternative to administration if all the evidence points in that direction. For example, it might be that the administrator recommends liquidation if there is very little chance of salvaging a recovery. The Creditors’ Meeting must take place within 10 weeks of the process starting, with each creditor given at least 14 days’ notice of the meeting. The meeting no longer needs to be a physical meeting, following the introduction of the New Insolvency Laws, 2016, unless more than 10% of creditors request a physical meeting. Once the creditors’ meeting has taken place, the administrator has to send a progress report on the administration at least every 6 months to the creditors, the, the administrator must also instruct the company to provide a Statement of Affairs. This document details the business’s assets and liabilities, including whether any of the assets are subject to a fixed or floating charge. The Statement of Affairs must form part of the administration proposal. Providing the proposal is accepted by the creditors, the administration process can proceed. A Company Voluntary Arrangement is put in place, or, if the administration has not been able to restructure and/or find a buyer, then the likely outcome is either a CVL, Compulsory Liquidation or Dissolution. If your company is facing insolvency and is at risk of being placed in administration, please contact us or call us on 02o7 831 1234 for a FREE initial discussion. Our insolvency practitioners have been appointed as administrators of many companies and we can explain things in detail and help you every step of the way.